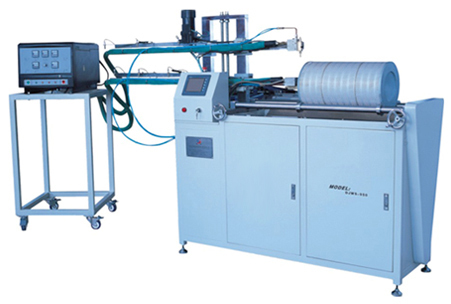 This type of machine is used to dispense the hot melt on the inner and outer surface of the heavy duty air filter. 1. The inner and outer mesh is well positioned together with paper by the hot melt. And the paper can remain together even under big air pressure. 2. The filter glued with hot melt will prevent the resistance from increasing as a result of no space between two pleats when filter paper is pressured. 3. The pitch of the machine can be adjustable according to the size of the filters through the PLC computer control system. The hot melt can be glued both in form of straight and spiral. 4. The inner and outer circle can be glued both or independently with the electrical adjusted. 5. This machine can be operated both automatically and manually.